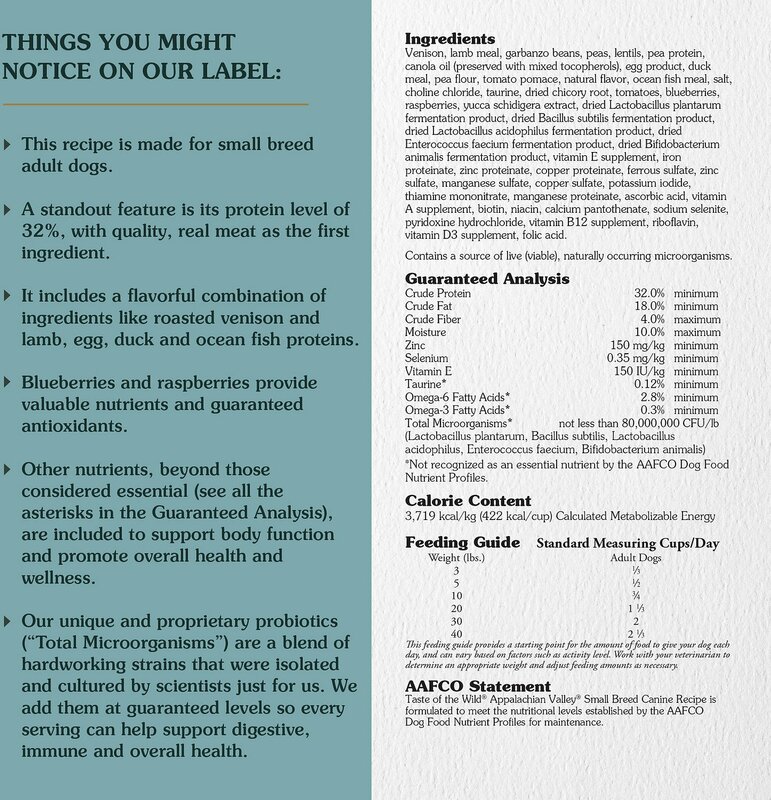 Nourish your small breed canine companion with the balanced diet nature intended with Taste of the Wild Appalachian Valley Small Breed Grain-Free Dry Dog Food! 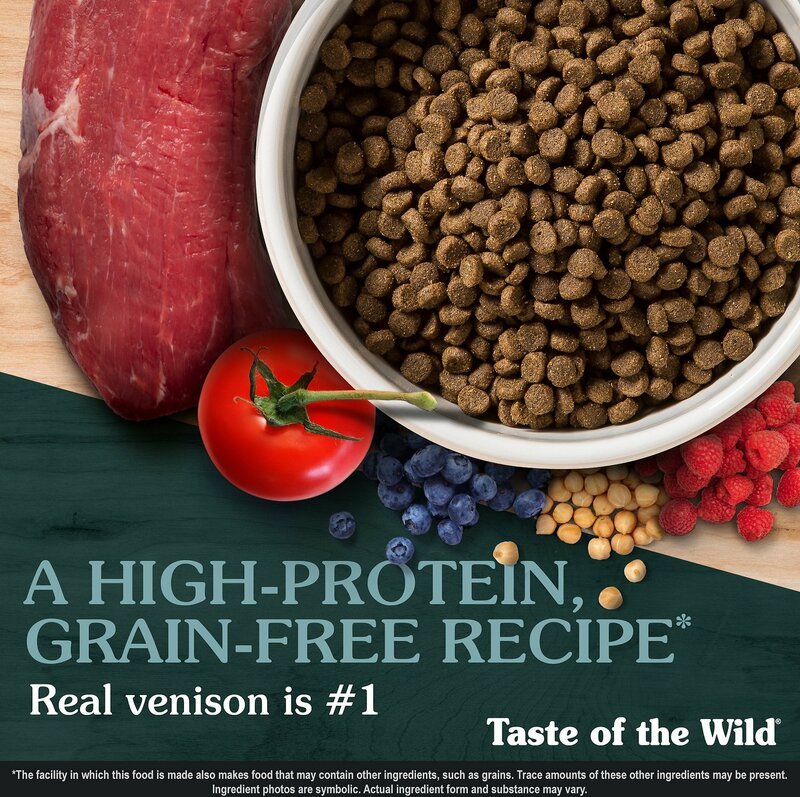 Formulated with novel proteins including venison, this grain-free recipe is made into small-size kibble just for your small breed dog’s tummy and teeth. Probiotics and prebiotic fiber help to support healthy digestion, while a blend of venison, lamb, egg, duck and ocean fish proteins provide optimal amino acid nutrition. 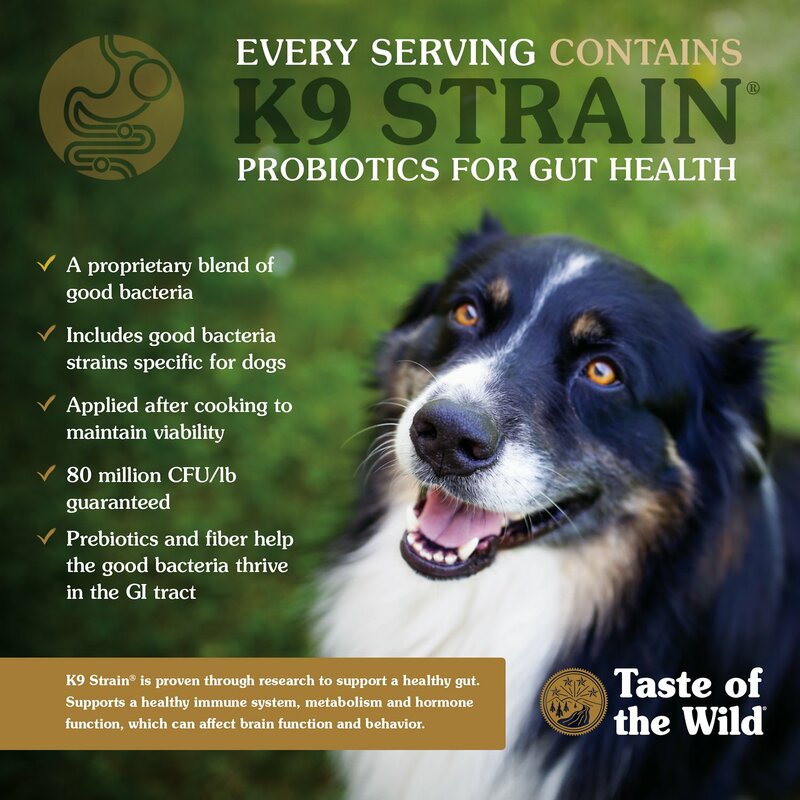 Rich in proteins and fat, this recipe provides balanced nutrition, the energy that active small dogs need and of course a taste of the wild they constantly crave! Grain-free recipe made with real venison as the first ingredient followed by other real protein-rich ingredients including lamb, egg, duck and ocean fish proteins for lean nutrition and to help support strong muscles. 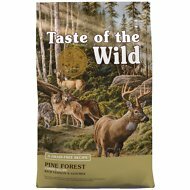 Venison, Lamb Meal, Garbanzo Beans, Peas, Lentils, Pea Protein, Canola Oil, Egg Product, Duck Meal, Pea Flour, Tomato Pomace, Natural Flavor, Ocean Fish Meal, Salt, Choline Chloride, Taurine, Dried Chicory Root, Tomatoes, Blueberries, Raspberries, Yucca Schidigera Extract, Dried Lactobacillus Plantarum Fermentation Product, Dried Bacillus Subtilis Fermentation Product, Dried Lactobacillus Acidophilus Fermentation Product, Dried Enterococcus Faecium Fermentation Product, Dried Bi Fidobacterium Animalis Fermentation Product, Vitamin E Supplement, Iron Proteinate, Zinc Proteinate, Copper Proteinate, Ferrous Sulfate, Zinc Sulfate, Copper Sulfate, Potassium Iodide, Thiamine Mononitrate (Vitamin B1), Manganese Proteinate, Manganous Oxide, Ascorbic Acid, Vitamin A Supplement, Biotin, Niacin, Calcium Pantothenate, Manganese Sulfate, Sodium Selenite, Pyridoxine Hydrochloride (Vitamin B6), Vitamin B12 Supplement, Riboflavin (Vitamin B2), Vitamin D Supplement, Folic Acid. Contains A Source Of Live (Viable), Naturally Occurring Microorganisms. Our Sadie has a sensitive stomach and allergic to chicken. We've had a time finding something she likes (picky), she won't even eat treats. She loves this food, been on it for over a year and still eats it twice a day, never turned it down. Our Stella, isn't as picky but loves this food better than anything else we've tried. She's a rescue and has some facial damage and the small kibble works great for her. Way to go, TOTW! Our picky 8-pound mature dog absolutely loves the food! We have tried many different kibbles, but he cleans his bowl and always looks forward to mealtime. It has been hard to keep weight on this guy, but this food he cannot resist, a great find! We like that is is grain-free due to allergies. My 4lb female Chihuahua and 12lb toy poodle immediately went for it and had to get a couple of slow feed bowls because the poodle liked it a little too much and gained some weight, she is losing weight now. My 15lb male mini poodle took about a week before preferring it over the old stuff but all are loving it now. This company cares about pricing and quality. Helped my once fat wiener dog lose weight. 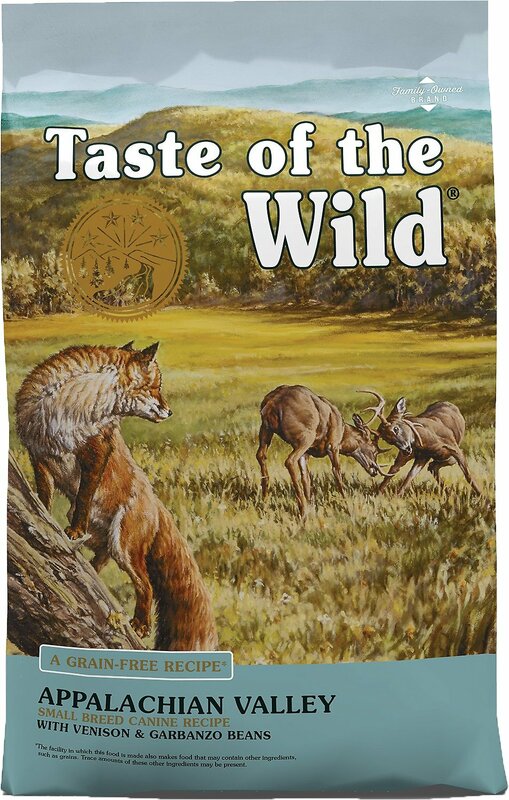 Noticed she has a lot more energy after switching her to taste the wild. Really quality stuff. fussy eater, tiny dog just the right size,tossed out his old food when added the new. AWESOME love the auto feature,saves me trips to the store just for dog food. A few years back a friend began giving me the tail ends of the TOW bags he bought for his large husky. I was worried about getting my tiny girl habituated to higher-end kibble, feared I wdn't be able to afford it. Well, bought her 28lb bag in August, as of now it's still 2/3 full! 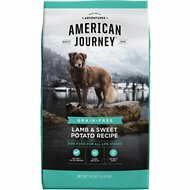 I ordered this food for my dog who is diabetic. She doesn't like it, but our other healthy dog does! Chewy's service is great, food was delivered in 2 days. This food tastes like crap! 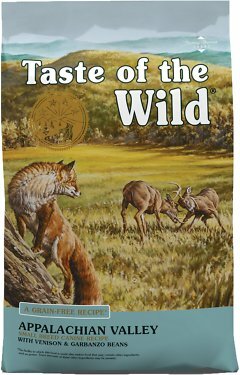 When it is mixed with my favorite foods...Natures Recipe Lamb and Sweet Potato and Instinct Raw, I can deftly spit out the TOTW venison kibble all over the kitchen floor. The Taste of the Wild is now feeding the white wing doves who nest in my oak trees! They seem to love it. The one star is for the doves. Used to buy a version of this at a local store but they were out of stock. Went to Chewy and ordered it. 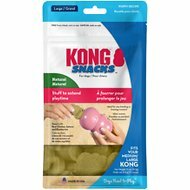 Different package but much easier for our 6 pound Chihuahua to eat. Came very quickly too! She loves it!